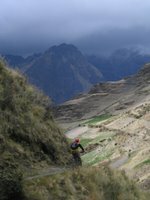 My mind drifted as the Landcruiser, laden with 6 riders, 2 guides and their bikes, rattled its way up the dirt track heading into the heart of the Bolivian Andes. It had been less than 24 hours since I had broken my 3 cardinal riding rules - (1) Never ride in groups, (2) Never ride a hire bike, and (3) Never use a guide. After 15 years of ´doing it myself´, I had finally been forced to give in and, after yesterday´s insanity, I had no regrets. 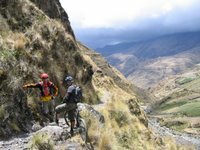 We had left La Paz the previous morning and, during the 4 hour drive, had swapped war stories, sussing out everyone else´s riding ability. Equipped with the hire bike version of the Kona Coiler, all suspension set super soft, there was a faint whiff of alpha-maleism in the back of the truck and the conversation covered crashes, bikes and home trails. After a couple of months´travelling with my girlfriend, it was a real treat to let rip with some good old biking talk. 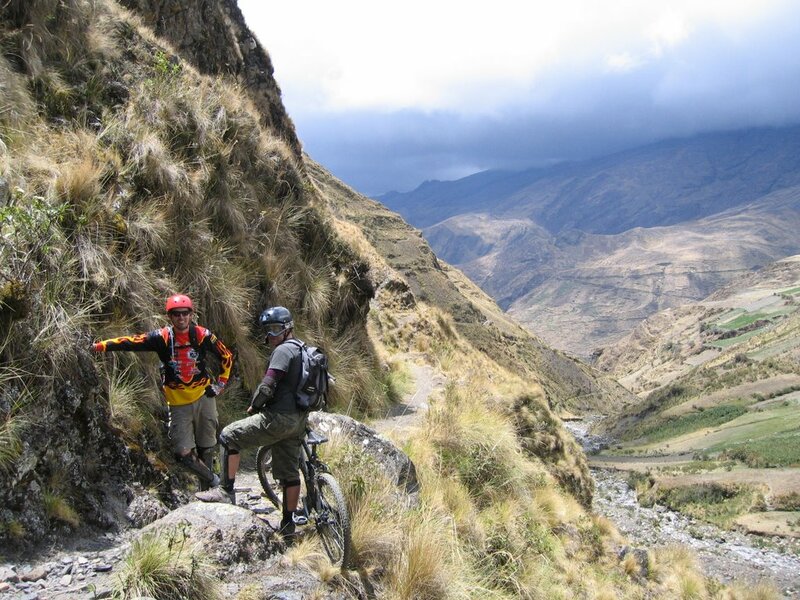 There was the usual faff at the start of the trail (see cardinal rule (1) above) as we checked bikes and bodies, but we were at 4600 metres and there was 2000 metres of vertical height to lose. We had no time to waste. 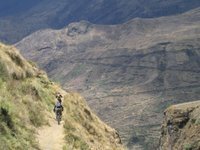 The trail, essentially a donkey track and reminiscent of riding in Las Alpujarras of Southern Spain, dropped into a dry, yellow valley. At first, the valley was wide and we could carve wide lines over dusty turf, getting a feel for the bikes and the spongy front ends (which would later prove invaluable). 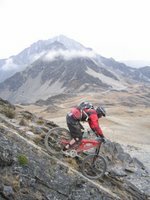 It was steep, narrow, technical riding and we made swift weight changes as we danced between rocks, taking lines that we would never take on our own bikes. After crossing a river, we dropped onto perfect llama singletrack - packed, dusty and 4 inches wide - which contoured high on the valley side. It was focussed riding with a big drop to the right and we were forced to concentrate, moderate speed, stay positive and ride smoothly. It was an intoxicating mix of fear and excitement. I could have ridden it all day. After a late lunch, the valley widened and the final 2 kilometres of the day will be etched on my mind forever. A set of steep switchbacks, ridden fast with the back wheel sliding speedway style and the front wheel tracking to hold the trail, opened into swooping chicanes before a 4 foot drop off. I was flying and overtook one of the others before nailing an S section with bermed walls to keep the speed. I was in a zone where I was going too fast to worry about crashing and even a last minute mistake before the road which almost saw me flying off a 30 foot drop made no difference. It had been my first riding for several months and it had been unbelieveable. I hoped that the second day would be as good. Despite a thunder storm in the night, the second day dawned sunny and the views of 6000 metre snow-capped peaks as the Landcruiser headed ever upwards were stunning. It took 2 hours to reach a small plateau 4700 metres above sea level where we geared up in a chilly wind which seemed to be blowing dark clouds our way. I set off down a serated rock slab which swung into a tight left hand berm before throwing me out onto a barren moonscape of rock with multiple lines. We swerved down to, and over, the road, the suspension soaking up the drop on the other side, before sneaking onto a path through jagged rock. Chad, riding clipped in, lost his front wheel on the greasy rock and sliced through his 3 riding tops before coming to a rest. 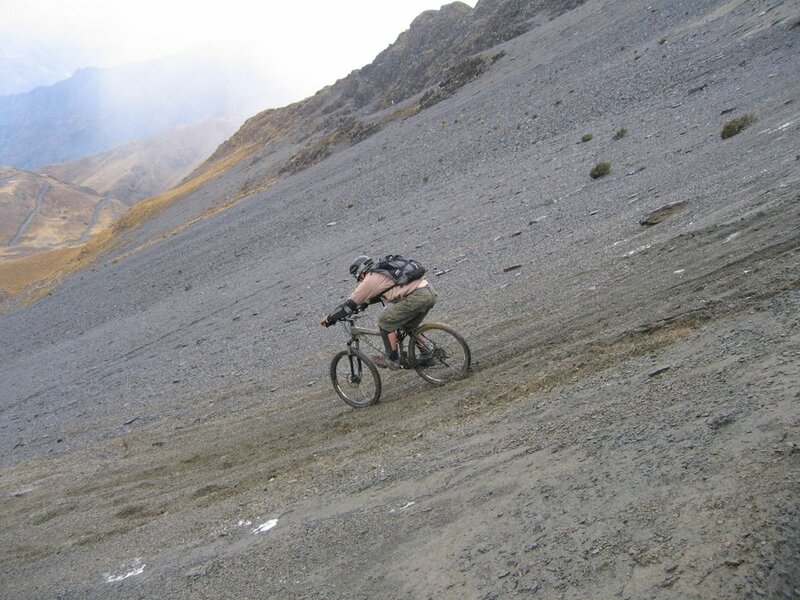 As snow started to fall, we rode a short section of track to a steep scree slope which freaked out the Aussies who had never seen scree or ridden in wet conditions. The Kiwis and I were loving it – it all seemed so familiar. 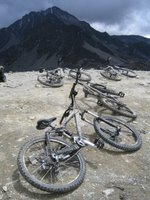 Although everyone was a little nervous to ride something so different, you simply dropped in, pushed your weight back, locked the back wheel as an anchor and feathered the front brake to try to control speed. By gently leaning, you could almost change direction by carving the wheels in the ski like a ski, but it was mostly luck whether you held the line. It was disconcerting to effectively have no control over your speed, but exhilerating to slide the bike down the hillside. At the bottom, we bounced through some rocky stuff and up the far side of a gully onto a trail just a foot or so from the cliff edge. We skittered over slippery bedrock, the back wheels skidding with the same agression as if they had hit a wet root, and onto an open piece of ground where we cleared two small natural jumps. In the air for the second, I registered the tight, left hand, soily berm too late, but on landing just managed to dig the tyres in and hang on. The left was followed by a right and I had too much speed. The bike slid sideways and still I managed to hang on, though a small part of me knew that it was only a matter of time. The next left was wider and the bike, still out of control, carved through the turn. There was one corner left, a right hander, one more to safety. I came in far too fast, far too tight and the wheels dug in, scrabbling for purchase, but found none and the bike slid out from under me. The others cheered my failure and I lay in the dirt laughing. Six kilometres on the dirt road brought us to a small hump, a knackering push at altitude, from where we enjoyed the best section of riding in the entire trip. It was a landscape of turf, gullies, mounds, boulders, scrub and drops. I followed James, the guide, as he rocketed on his own line. Carving into gullies, we flew up sidewalls and pumped up small inclines into the next natural halfpipe. 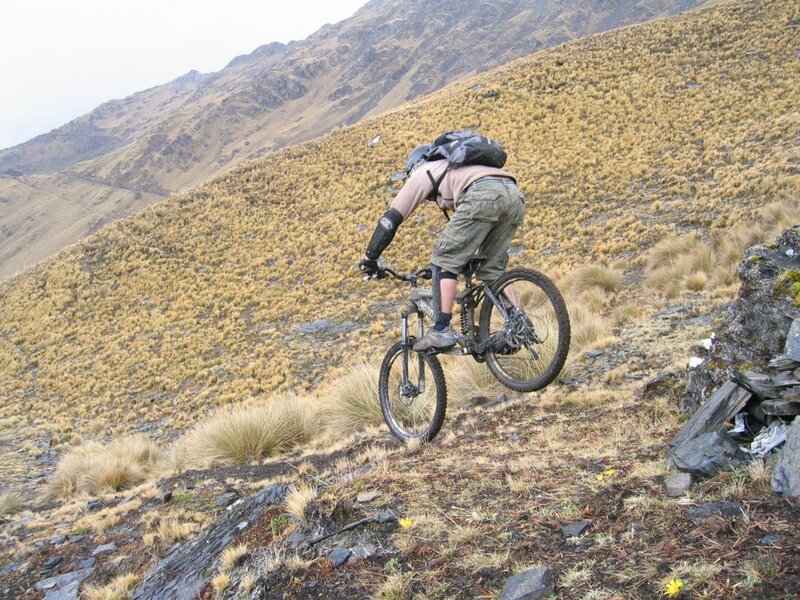 We flicked through tight singletrack, bracnhes brushing our bodies, before James stepped up a gear. Drops, kickers over small ridges, hard cornering and full speed air. I rode the best that I have ever ridden. It was the perfect combination of speed, air and technical cornering. At the road, we regrouped and then flew down twisty, fast singletrack between trees and boulders. It was an invitation to accelerate and we pushed hard, driving through corners, looking ahead. It was perfect reactive riding. We blasted out of the scrub onto an small open plain where I rode 3 abreast with James and Stuart, jumping ditches, flying off kickers before we funnelled into a loose track with off camber turns. We were losing height fast and soon enough we reached a small village from where we rode donkey tracks, the ridges of irrigation channels and open fields. In a rock staircase somewhere in the middle, I caught my front wheel and went over the bars, landing on my head and opening a wound on my shoulder, but it made no difference. 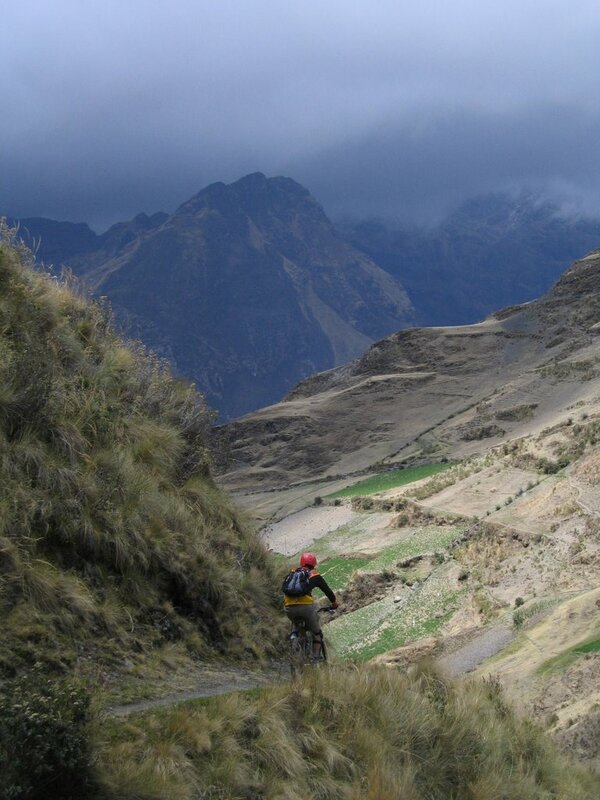 The last two days`riding had been varied, demanding, fast, technical and in remote, beautiful scenery. 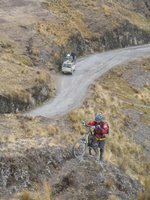 As we reluctantly loaded the Landcruiser for the 4 hour drive back to La Paz, we reflected that we had been privileged to ride in Bolivia and I don`t think that I was alone in hoping that one day I will return.